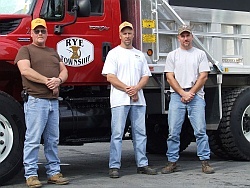 The Rye Township Road Department is located in the Rye Township Municipal building on New Valley Road. This Department has 2 full-time employees who maintain the Township's 26.5 miles of roads utilizing a temporary part-time employee as needed for snow/ice removal. The full time employees are responsible for minor road construction, solving drainage problems, winter snow and ice removal, mowing the sides of the roadway, erecting traffic signs and equipment maintenance. Larger road projects such as pavement of roads or bridge/large culvert replacements are formally advertised and the lowest bid awarded to outside contractors.